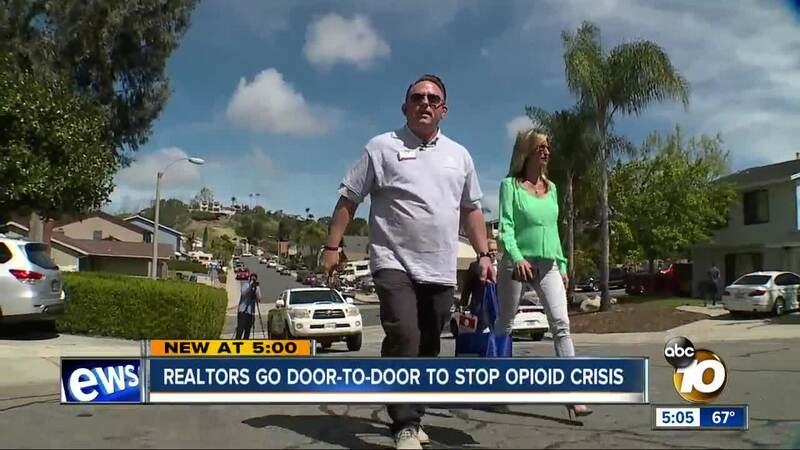 SAN DIEGO — Nearly 200 realtors and elected officials in San Diego kicked off an innovative program aimed at reducing access to opioid pain killers. Volunteers went door-to-door in the city, handing out information cards and special plastic bags for residents to properly dispose of their unneeded and expired prescription drugs. For the fourth year in a row, the number of San Diegans who died from unintentional drug-related deaths went up. To counter the increasing number of opioid deaths, San Diego County Sheriff Bill Gore, County Supervisor Kristin Gaspar, Safe Homes Coalition and the San Diego Association of Realtors launched the “Keep Kids Safe” program. According to Kevin Burke, the CEO of the San Diego Association of Realtors, real estate agents have noticed a disturbing tend in the past few years. “We had people coming to our open houses, going in to take medicine out of the medicine cabinet," Burke said. Thieves pose as prospective buyers, then steal prescriptions from the medicine cabinets when they tour the property. That's why more nearly 200 realtors volunteered their Saturday to spread the word about disposing of unneeded or expired prescription drugs. Flushing opoids down sinks and toilets causes pollution to the water supply, so volunteers offered to distribute 100,000 perscription bags, which can be taken to 20 different disposal sites in San Diego County. Sandy Nolan lost her son, Jerry, to a heroin overdose almost 11 years ago. His gateway drug was inside their home. “It all started with prescription drugs," Nolan said. That is why she is so passionate about eliminating access to dangerous opioids. “When you’re done with that prescription, and you don’t need it anymore, get it in that bag, take it to the disposal spots, and get it out of your house, right away," Nolan said.